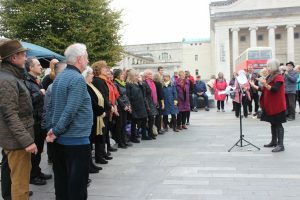 Music in the City in Guildhall Square, Southampton, 7th October. As an intern, I was able to watch the choir from their early rehearsals and acknowledge their progression and ability to blend and sustain great dynamics as well as working brilliantly as an ensemble. The choir created an upbeat ambience, inducing the audience with energy and emotion, which all members claimed to have felt and enjoyed through singing and performance. Amazing choir conductor Fiona Funnel is leading with full energy and dedication at the festival. Inspiring to watch and learn!